Golden Nectar Real Leatherwood Honey is produced from the Leatherwood Trees located in the World Heritage Rain Forest Areas on the West Coast of Tasmania. This is the only place in the world this fine aromatic Honey can be produced. The air in this area has been accredited as being the cleanest air on the planet, and the land is entirely insecticide and artificial fertiliser free. 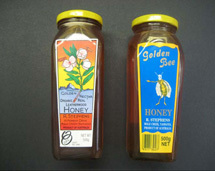 Golden Nectar Real Leatherwood Honey is certified Organic both in Australia and the USA.